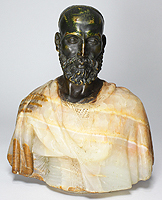 A Very Fine and Rare French 19th Century Orientalist Onyx and Bronze Bust of "Arabe d’El Aghouat" depicting a Middle-Eastern Bearded Man wearing a skull-cap, attributed to CHARLES-HENRI-JOSEPH CORDIER (FRENCH, 1827-1905). Circa: 1860. 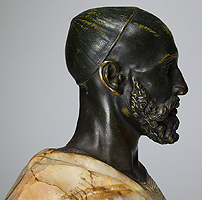 CHARLES-HENRI-JOSEPH CORDIER (FRENCH, 1827-1905) Cordier first exhibited a polychrome male portrait bust at the Paris Salon of 1848. 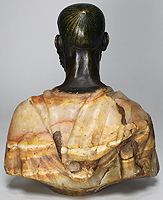 Its female companion, Venus africaine, was subsequently shown at the 1851 London Great Exhibition, where it was purchased by Queen Victoria. This marked the official recognition and approval of the new “exotic” sculpture versus those drawn from Antique examples. “The love of luxury which characterizes the Second Empire created an excellent climate for polychrome and Bronze and Onyx sculpture. An artist like Cordier was assured of high-ranking patrons… The sculptor participated in all of the era’s most influential decorative projects: the Paris Opéra, the Rothschilds’ Château de Ferrières and the Hôtel de la Païva on the Champs Elysées.” (Andreas Blüm, The Color of Sculpture: 1840-1910, Amsterdam, 1996, p. 39) Moreover, the Orientalist flavor of Cordier’s work followed a trend set by artists like Delacroix, who ultimately favored color over line. 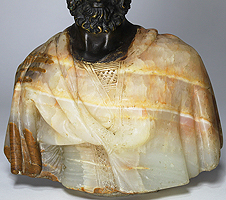 Most examples of Cordier’s busts were formed with bronze head and body on an onyx or porphyry bust. 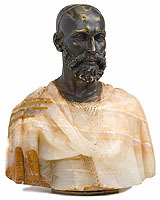 Many of Cordier's busts were result of a commission for the new ethnographic gallery planned for the Musée d’Historie Naturelle in Paris. As he explained himself in the Bulletin de la Société d’Anthropolgie de Paris, he set out to produce “a general type combining all the beauties specific to the race under study.” With this doctrine in mind, La juive d’Alger was conceived during Cordier’s second stay in Algeria, and an example was exhibited at the International Exhibition in 1862 in London, as well as at the Paris Salon of 1863. 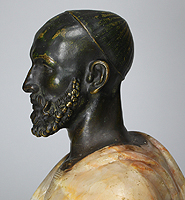 Another similar examples of this work by Cordier titled "Arab from Biskra, Circa 1856" and "Arab from Aghouat" are both currently on display at the Musée de L'homme, Paris. 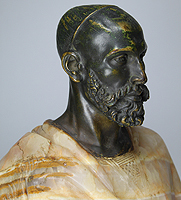 A Very Fine and Rare French 19th Century Orientalist Onyx and Bronze Bust of "Arabe d’El Aghouat" depicting a Middle-Eastern Bearded Man wearing a skull-cap, attributed to CHARLES-HENRI-JOSEPH CORDIER (FRENCH, 1827-1905). Circa: 1870. Note: This model by Cordier is illustrated in the Catalogue Raisonnée. Cordier first exhibited a polychrome male portrait bust at the Paris Salon of 1848. 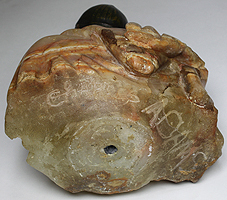 Its female companion, Venus africaine, was subsequently shown at the 1851 London Great Exhibition, where it was purchased by Queen Victoria. This marked the official recognition and approval of the new “exotic” sculpture versus those drawn from Antique examples. “The love of luxury which characterizes the Second Empire created an excellent climate for polychrome and Bronze and Onyx sculpture. An artist like Cordier was assured of high-ranking patrons… The sculptor participated in all of the era’s most influential decorative projects: the Paris Opéra, the Rothschilds’ Château de Ferrières and the Hôtel de la Païva on the Champs Elysées.” (Andreas Blüm, The Color of Sculpture: 1840-1910, Amsterdam, 1996, p. 39) Moreover, the Orientalist flavor of Cordier’s work followed a trend set by artists like Delacroix, who ultimately favored color over line. 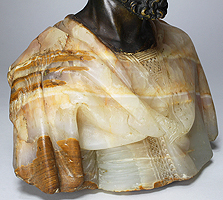 Most examples of Cordier’s busts were formed with bronze head and body on an onyx or porphyry bust. 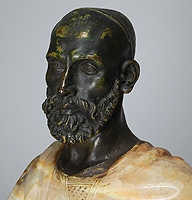 Many of Cordier's busts were result of a commission for the new ethnographic gallery planned for the Musée d’Historie Naturelle in Paris. As he explained himself in the Bulletin de la Société d’Anthropolgie de Paris, he set out to produce “a general type combining all the beauties specific to the race under study.” With this doctrine in mind, La juive d’Alger was conceived during Cordier’s second stay in Algeria, and an example was exhibited at the International Exhibition in 1862 in London, as well as at the Paris Salon of 1863. 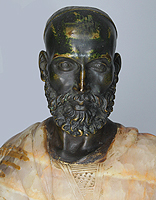 Another similar examples of this work by Cordier titled "Arab from Biskra, Circa 1856" and "Arab from Aghouat" are both currently on display at the Musée de L'homme, Paris. Charles Henri Joseph Cordier (19 October 1827 - 30 May 1905) was a French sculptor of ethnographic subjects. Cordier was born in Cambrai. 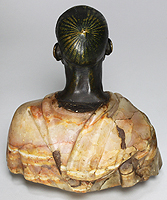 In 1847, a meeting with Seïd Enkess, a former black slave who had become a model, determined the course of his career. 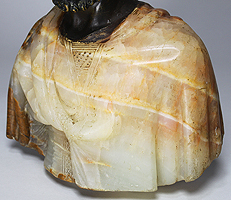 His first success was a bust in plaster of a Sudanese man "Saïd Abdullah of the Mayac, Kingdom of the Darfur" (Sudan). This was exhibited at the Paris Salon of 1848, the same year that slavery was abolished in all French colonies. It is now housed at The Walters Art Museum. In 1851, Queen Victoria bought a bronze of it at the Great Exhibition of London. From 1851 to 1866, he served as the official sculptor of Paris's National History Museum, creating a series of spectacularly lifelike busts for their new ethnographic gallery (now housed in the Musee de l'Homme, Paris). "Beauty does not belong to a single, privileged race, I have promoted throughout the world of art the idea that beauty is everywhere. Every race has its own beauty, which differs from that of others. The most beautiful black person is not the one who looks most like us." Cordier took part in the great works commissioned by the Second French Empire (Paris Opera, Musée du Louvre, the Hôtel de Ville) or by private interests such as Baron de Rothschild. He died in Algeria.